This is a post about the arrival of THE GUM OF THE FUTURE. For a while, Maxine was obsessed with Pop! 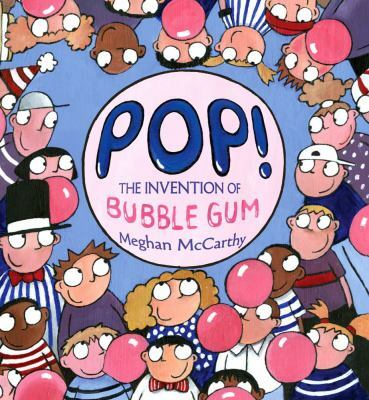 : The Invention of Bubble Gum by Meghan McCarthy, an author who keeps knocking out awesome non-fiction picture books with googly-eyed characters. (Her latest is The Incredible Life of Balto, about myths and truths behind the story of the dogsled-pulling canine hero. Our favorites are Seabiscuit the Wonder Horse , primarily because the bug-eyed, toothy cover picture of the equine underdog makes us laugh every time we look at it, and Astronaut Handbook , because it addresses the crucial issues of space pee.) (Which, admit it, you wanted to know all about as a child and no one ever told you.) But I digress. Pop!’s last couple of pages — the sticky bits of popped-bubble detritus, if you will — feature facts about Walter Diemer (1904-1988), the guy who came up with bubble gum, and about gum itself. (40 million pieces of bubble gum are sold daily! Scientists found a 9,000-year-old wad of chewed birch resin in Sweden!) McCarthy also mentions a British scientist named Professor Cosgrove working on a non-stick bubble gum. Lo and behold, THAT GUM HAS ARRIVED! It’s called Rev7. According to its American publicist (who confirmed that this is indeed Professor Cosgrove’s product), it disintegrates to a fine powder within six months after mild agitation in water. And depending on the surface it’s dropped on, it’s 30% to 100% easier to remove than regular gum. You can read about the anti-stickiness science on Cosgrove’s company’s web site, and now I will be using the technical term “chewing gum cud” all the time. Cosgrove is an expert in polymers, according to this NYT article on British venture capital financing. Presumably the reason his company is called Revolymer is because it is a revolution in polymer, but I am afraid to ask. The web site for Rev7 Gum is disturbing (o Flash, how we loathe thee!) but trust me, the gum is beginning its rollout and will soon be available across our fair shores. When there is a “buy online” link I will add it. Until then, you can read Pop! over and over. And then please do explore the rest of McCarthy’s oeuvre. Your non-fiction-loving picture book fan will thank you.